A very frequently asked question is one about the 35 mm format focal length equivalent of the lenses used on Hasselblad's 6x6 format. It is often asked, perhaps because there is no single answer. The aspect ratios of 6x6 format (1:1) and 35 format (1:1.5) differ considerably, and an answer will depend on what aspect is used in the comparison. Manufactureres usually only state the diagonal angle of view of the lenses they produce. As a result, the diagonal often has to be taken as the basis for comparisons. In Figure 1, 6x6 format (black outline) and 35 mm format (red outline) frames that have the same size diagonal are superimposed. As Figure 1 shows, the different aspect ratios of both formats lead to a rather different framing: the 6x6 frame is taller than the 35 mm format frame, yet less wide. A subject just fitting inside the 35 mm frame horizontally will not fit inside the 6x6 frame, and conversely, a subject just fitting inside the 6x6 frame vertically will not fit inside the 35 mm frame. Framing in both formats is equivalent only in the rare case that subjects have to be framed diagonally. The differences in both horizontal and vertical aspects then still make it very hard, if not impossible, to crop an diagonally composed image in either format to the image produced by the other format. Another option would be to select lenses so that their vertical angles of view are the same (Figure 2). The difference in aspect ratios of the two formats then shows itself in the horizontal angle of view, which is 1.5 times as large on 35 mm format as that of the equivalent lens on 6x6 format. It obviously is very easy to crop the larger frame to produce an image exactly the same as that produced inside the smaller frame. The (vertical) equivalence is true. Conversely, when the lenses are chosen so that the horizontal angles of view are the same (Figure 3), the difference in aspect ratio leads to a 1.5 times larger vertical angle of view on 6x6 format. Again, cropping the taller frame to produce an image exactly the same as that captured in the smaller frame is not a problem, i.e. the (horizontal) equivalence is true. The Hasselblad focal lengths given in the table to the right are nominal. The actual focal lengths differ, not only from this nominal focal length, but also from that of other Zeiss/Hasselblad lenses having nominally the same focal length. To keep the table simple, the choice was made to use the nominal focal lengths instead of the true focal lengths. As a result the table only gives an approximation of the equivalent 35 mm format focal lengths. Since the known focal lengths of 35 mm format lenses are also nominal, with their true focal lengths rarely known, an approximation will be the best a general comparison can achieve. For critical purposes, an actual test of all the lenses involved will be necessary. Ever since Hasselblad introduced a film magazine producing 16 frames in 6x4.5 format in 1956, 6x6 is not the only Hasselblad film format. The difference in the aspect ratios of 35 mm format and 6x4.5 format is small. The 6x4.5 format is a little bit taller than the 35 mm format. Consequently, the spread in equivalent focal lengths depending on what aspect is chosen to be equal is also smaller. 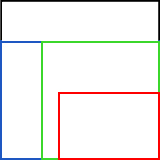 Figures 4 and 5 show the difference in framing when lenses are chosen so that either the horizontal or vertical angles of view are equal (blue outline = 6x4.5 format). The Hasselblad focal lengths given in the table to the left are nominal. The actual focal lengths differ, not only from this nominal focal length, but also from that of other Zeiss/Hasselblad lenses having nominally the same focal length. The third and last Hasselblad format to consider is the 4x4 cm 'superslide' format. It was introduced in 1957, to produce slides that could be projected using normal 35 mm format projectors. The aspect ratio is the same as that of the original 6x6 format, so the same considerations apply. Though being much smaller than the 6x6 format, the angles of view will be smaller too. The equivalent 35 mm format focal lengths will be longer accordingly. Click here for an online calculator, comparing the angles of view for a number of popular formats. Copyright 2009 - Q.G. de Bakker. All rights reserved.